GREAT NEW PRICE ON THIS BEAUTIFUL, MAINTENANCE FREE, MOVE IN READY HOME WITH POOL! Only steps away from the golf course, this 3,042 sf Villa style home has been meticulously maintained both inside and out. Gorgeous gourmet kitchen has been recently updated with new top-of-the line appliances, fixtures and stunning granite counter tops with bar seating. Enjoy soaring ceilings, a fireplace, entertainment center and abundant natural light in the open great room, dining, kitchen and breakfast nook. The main level also includes 3 bdrms, 3 full baths and a separate den. The 2nd level features an expansive bonus room, office or craft area with a built-in desk, another full bathroom and inviting balcony deck to enjoy the sunset and golf course views. 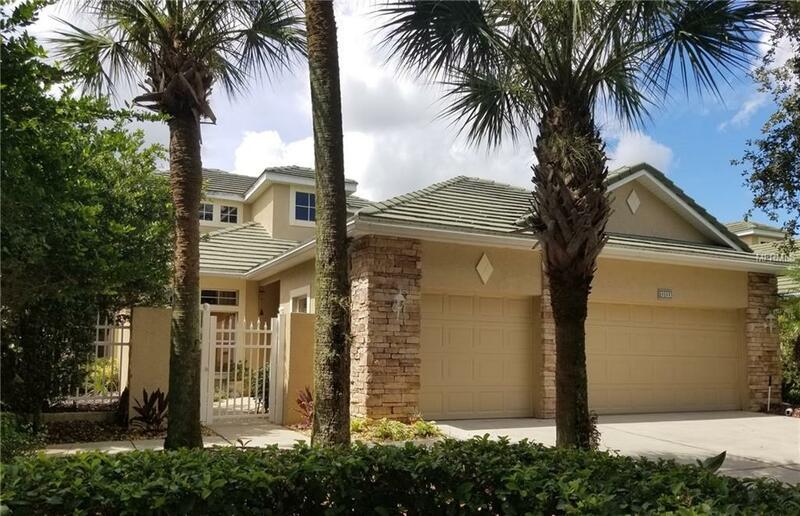 This home is loaded with upgrades beginning with the stunning travertine flooring, crown molding throughout, tray ceilings, surround sound system in main rooms and lanai, central vacuum, intercom and security systems. Newly painted throughout in warm neutral colors. Even the 3 garage in this home is worthy of mention with tons of beautiful built-in cabinetry and ceiling mounted storage systems. Must see to truly appreciate this beautiful, well-appointed, and well-maintained home.